It was a rare sight last night as football fans were applauding the pinstripes. 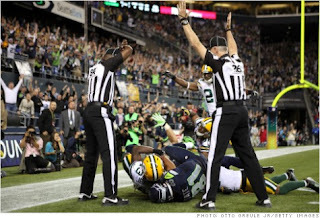 The return of the unionized NFL officials after three challenging weeks for the replacement refs has been praised as a victory for the game. However, after reading accounts comparing the league's union-fueled victory on the gridiron to what transpired in Chicago earlier this month with the powerful teachers' union, I have to speak up. One of the sticking points with negotiations for both the NFL refs and the Chicago teachers was that the unions wanted to protect their most tenured members. Neither union wanted to make it easy for the league or Chicago to let go of ineffective employees. "First In, First Out" is a common union objective. Fire the newbies first. It doesn't matter that they collect smaller paychecks or that they may be more passionate about the profession. Merit be damned. It doesn't seem to matter that 40% of the students in Chicago's public schools fail to graduate. Don't you dare suggest letting go of the older, costlier, and less effective educators. Now do you see why the comparisons don't hold up? The reason why fans were irate with the replacement officials -- even though the real zebras make plenty of mistakes of their own -- was because they made bad calls. The fans wanted accountability, and that's something that the very officials replacing the replacements -- and the teachers returning to work in Chicago -- don't have to face. Teachers are awesome. NFL refs are, well, they're not bad. However, there has to be accountability. There has to be fiscal responsibility to make sure that the quality is commensurate with the pay. The replacements blew a few calls, and as a result the entire lot was forced to fall on the sword. Don't bet that unions would ever let that happen.